One of the main attractions for tea lovers in Hong Kong is the Flagstaff House Museum of Tea Ware. It is located in the island on the Hong Kong Park. From the museum official website we have the following information: “Built in the 1840s, Flagstaff House originally served as the office and residence of the Commander of the British Forces in Hong Kong. It was converted to the Museum of Tea Ware in 1984, with a new wing, The K.S. Lo Gallery, added in 1995. 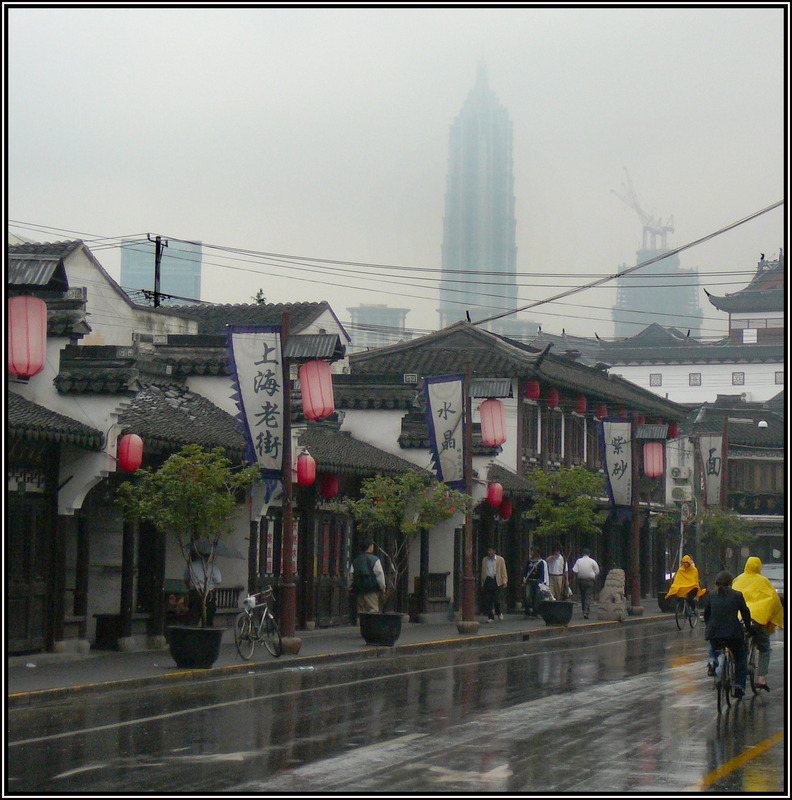 Alongside its exhibitions, the Museum holds regular demonstrations, tea gatherings and lecture programs to promote ceramic art and Chinese tea drinking culture”. The best way to get to the museum is through the metro (MTR) Admiralty station stop. On the Admiralty station take the 1C exit, turn right and follow the signs to the Hong Kong Park. Map of the Admiralty station indicating exit C1. The museum is on the right. On the entrance of the museum there are small samples of tea to show color, shape and texture; utensils for tea brewing and tea serving. Since the building was a house/office it contains many rooms in two floors. One of the rooms have the traditional round tea table and benches. The displays are on the walls. One of the rooms is for the children play. It has Tea Toys made out of wood. The idea is to start the tea education of the children early, as a play. Tearoom for the children with Tea Toys to play. 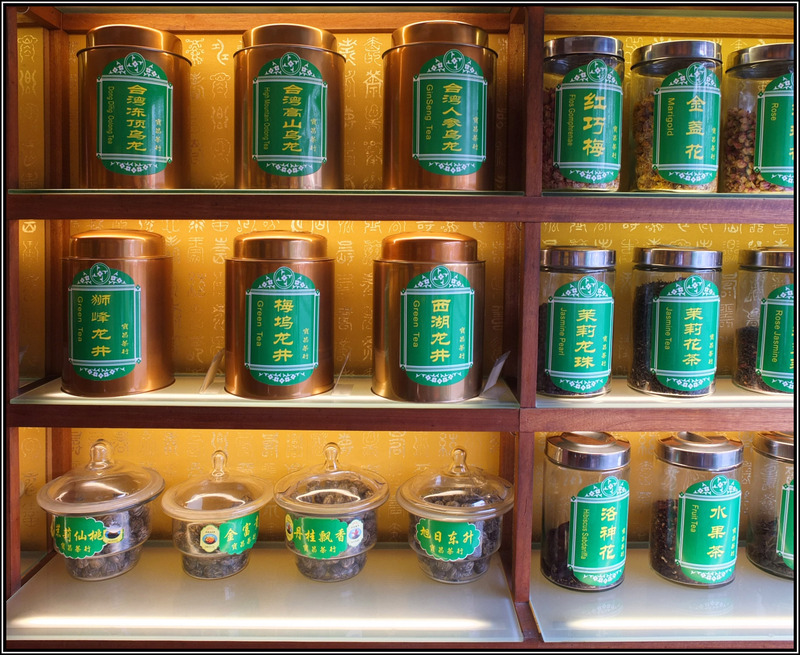 In the surroundings of the Yu Garden (aka as Yu Yang) in Shanghai there are many tea shops mostly for tourists that want to taste different teas and buy some for use or as a gift. For many people this is the first time they experience the Chinese teas. The shop area is an old part of the town that keeps the traditional buildings in very good shape and clean. The tea quality is average to good, enough to be a nice drinkable tea. In the shops they always serve free tea. They make nice demonstrations on how to prepare and drink tea. 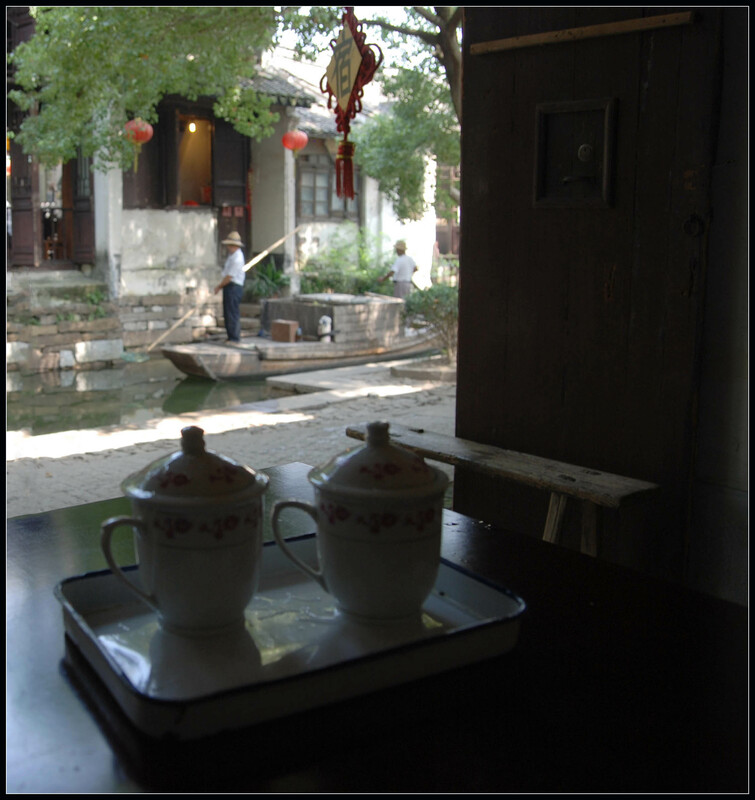 Visitors sit around the table to enjoy the teas without obligation to buy. It is always fun to go to those stores and spend time tasting teas, also buying gifts, ceramic and utensils for tea making. There are always something to enjoy and learn. 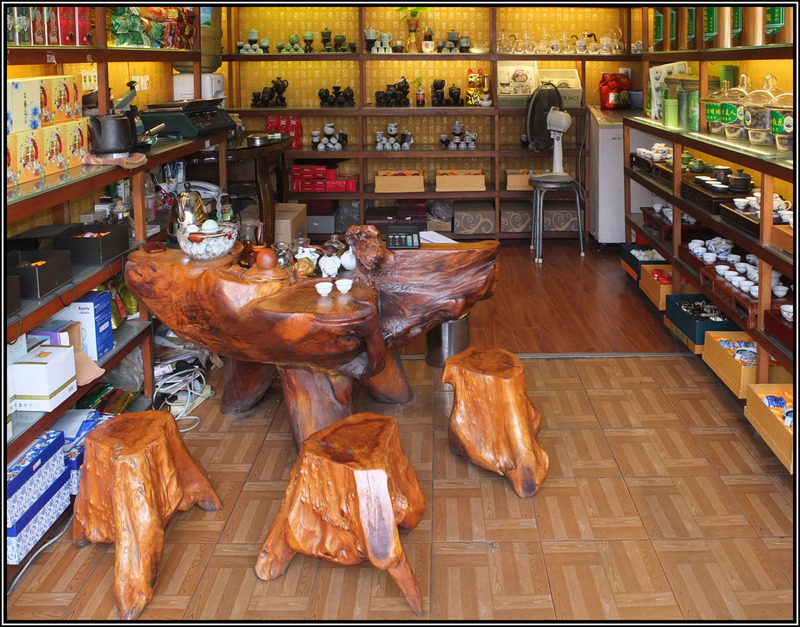 Here are few pictures of a typical tea shop. The key area is a large wood table carved with multiple levels. The table has a place to brew the tea, serve and store all accessories for tea making. The water is heated with the electric kettle allowing to have always the water in the proper temperature for each type of tea. 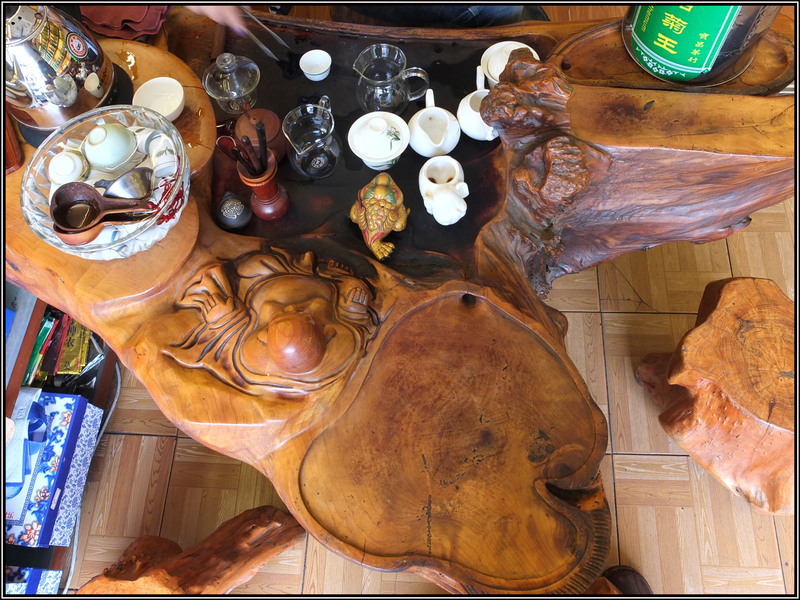 There are channels in the carved wood to collect the water spilled from the cups. The water is directed to small holes that convey the water to the bottom of the table where it is collected in a glass container. 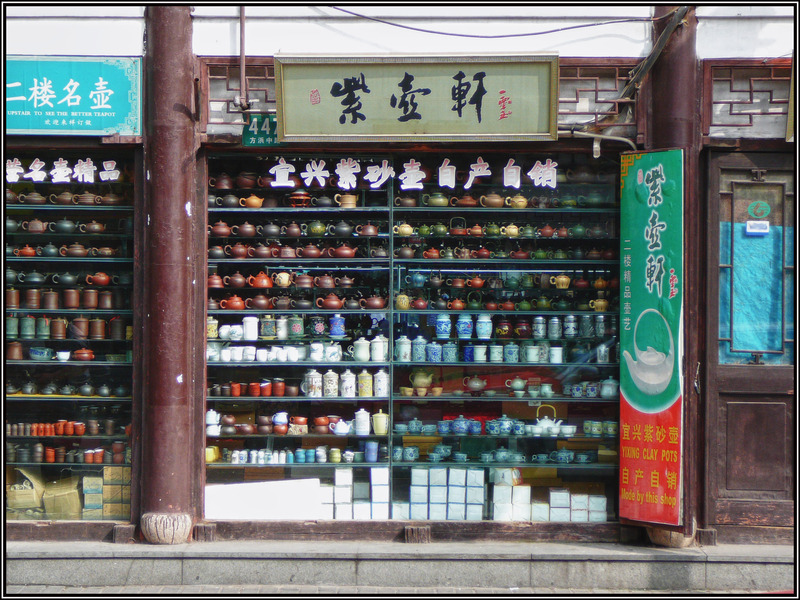 The stores usually have many types of teas, ceramic pots and wood utensils. Most of them have everything needed for tea starters. It is typical to have girls serving and selling tea. They are very polite, educated and speak good English. They have a reasonable knowledge of the teas and know how to sell pretty well. The tea packaging is very nice, either in nice boxes or cans.